Be confident in your vulnerability. Let me preface this by saying that I DESPISE appearing vulnerable. Growing up, I was known as the girl who wore her emotions on her sleeve, who was dramatic and moody. While I’ll admit that not a whole lot has changed in the dramatic sense of things, I have made it a point to appear tough, put together and confident. I would tell myself that I was always in control of the situation, that I had the upper hand and that I would never let what happened to another person happen to me. In a way, I refused to accept that I was simply human. I have always been a student of life. I LOVE talking to people from all over the world, learning about them and seeking advice and wisdom so as to maybe approach situations in my life with a little more awareness. I have become incredibly confident in myself and the person that I am, though almost to a fault in that I confuse confidence and control on an almost daily basis. But nevertheless, I always seek to learn from situations, to walk away with some piece of wisdom that I can pass on to the next person I see who is about to act how I did. To make a long story short, I let my guard down with a guy which resulted in me falling for him, getting incredibly hurt and reacting at a stage-five clinger/crazy girl level. While I should have accepted that he was a complete douchebag who thrived on playing on girls emotions, I was more upset about how I reacted. I was furious that I let him get to me, to get under my skin and close enough that he could manipulate me. I was livid that instead of being the strong girl and just walking away without a word, I tried so hard to “win him back” and to convince him that I was different from all the other girls. I had lost control of the situation that I had such a firm grasp over at the beginning. The ball was not in my court, I didn’t have the upper hand, and I was vulnerable. I didn’t eat for three days and I cried for five. This loss of control wasn’t necessarily over this guy alone. He was more of a straw that broke the camel’s back that combined with me not having a strong support system, hating my job, in a less-than-ideal living situation, being single during the holidays, and whatever other self-pity nonsense you want to toss in there that caused me to spiral. But I won’t lie in saying that I was SO hurt. Why is it that matters of the heart can damage us so much more than any broken bone or harsh word in this world? But as I said before, I like to walk away from any situation with a learned lesson and I was able to add plenty to my list of lessons learned in life after this whole situation. I was able to start the New Year with a brand new outlook and list of goals and passions that I can only fully focus on if I’m single. But with all of these new goals comes certain vulnerability… but I think I’m ready. Being a human makes us mortal which automatically makes us vulnerable. We are vulnerable walking across the street, eating by ourselves in a café, talking to a new person and taking on a new task. 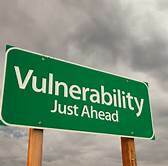 But if we are confident in that vulnerability, if we accept that we are human and not perfect, then we can approach so many things with such a higher level of confidence. And ultimately, that confidence will lead us to do many great things. So be confident in your vulnerability and embrace it.